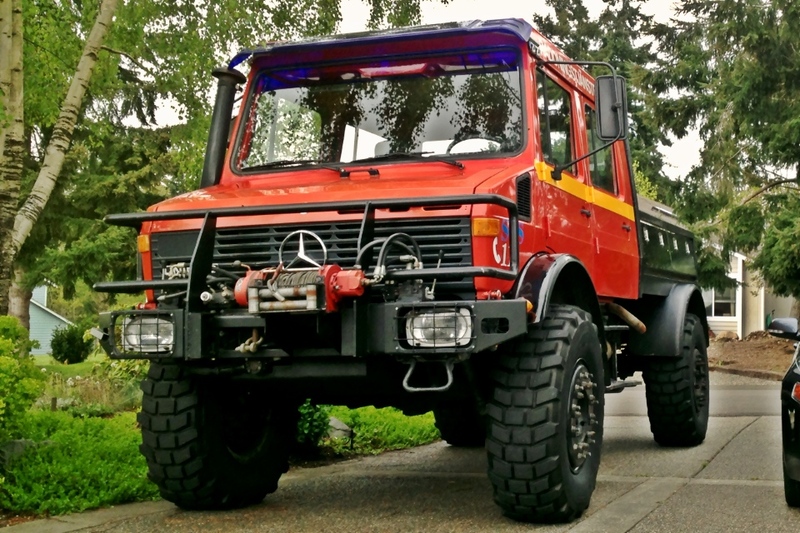 There’s a fantastic-looking, 1985 Unimog U1700L/38 DoKa for sale near Seattle at the moment. This truck and its square-jawed brethren represent my favorite iteration of the Unimog concept. They look more purposeful than their round-nosed, 70s-era forebearers, and not as tall and ungainly as Unimog’s most recent offerings. The “L/38” means it’s a long-wheelbase version and “DoKa” is, of course, what Mercedes-Benz engineers like to call a crew cab. This particular one, an ex-Swedish-Fire-Brigade truck — that’s “Räddningstjänsten” to all of you Nordic types — has just about every feature you could ask for: front and rear locking differentials, front and rear hydraulic winches (a 12,000 lb. Warn in front and a 20,000 lb. Braden in the back), a rear high-speed PTO, two-piece beadlock wheels, and an 5.7L turbo-diesel engine. Payload capacity? Over 3 tons—more than you can haul in three F350s combined! The ad says it has crawler gears, a custom truck bed, and a manual crane. I guess that’s how you lift stuff into the truck bed? This one doesn’t come with a PTO or hydraulics but it looks like the PTO port and brackets are there. I first saw Unimogs from this era as a kid visiting family in Germany and thought they were amazing even then. I like the burnt orange paint and don’t even mind that the top speed is 50 mph. The ad also states 23,450 miles, 3,475 hours. 500 miles since restoration. The asking price is $27,500. Located in the Garden State. Update: This truck is no longer available. Here’s a video of the Mercedes-Benz Unimog being put through its paces at the test track in Oetigheim, Germany. In case your German is a little rusty, here are the key points, translated. The Unimog began production in 1948 at Erhard & Sölle. In 1953 it came under the wing of Mercedes-Benz. In 1962 expanded Unimog production began. It was then available with a diesel motor and readied for the world market. The latest generation was introduced in 2002. It is, of course 4-wheel drive, has front, rear, and center locking differentials, 4-wheel disc brakes with selectable ABS, and portal axles which allow for 48cm (18.9 in.) of ground clearance. It has 8 forward and 6 reverse gears. The axles flex independently up to 30˚. 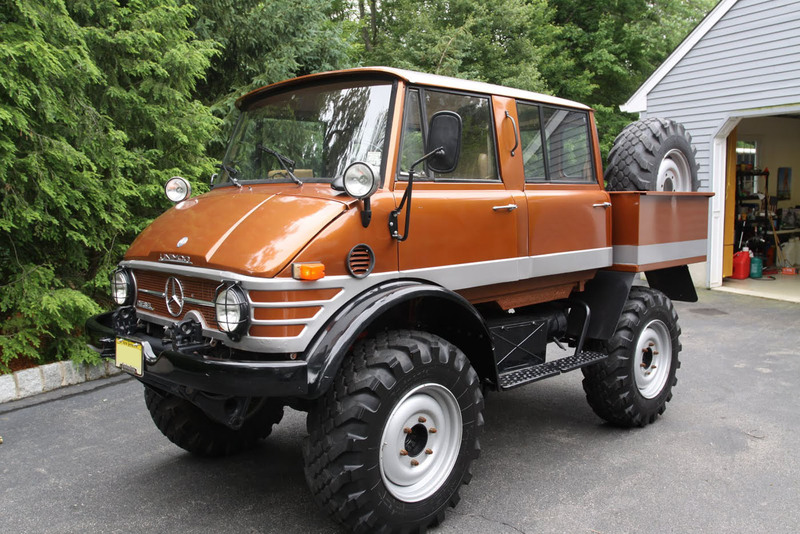 The Unimog can climb a maximum slope of 45˚ (100% grade). An adjustable tire pressure system helps to conquer steep slopes. The vehicle can travel along a 38˚ side slope and, given its snorkel, ford depths to 1.20 m (47 in.). Impressed? Head to your nearest Mercedes-Benz truck center. Unimogs start at 80,000 Euro (104,900 US$) or at least they did around 2006, when this video was uploaded. I found this video through my friends at Expedition Portal.